Many people ask “What is the best salt water chlorinator?” and still don’t get the right answer. They get more confused because of the different answers they get from salt water chlorinator “experts”. If you can relate with these people then you have come to the right place. Today, we want to rest this big debate by looking at a comprehensive buying guide for the best salt water chlorinator and reviews of the best systems on the market today. Probably the main difference between these systems is standard and self-cleaning chlorinators. Standard models require their cells to be removed every month and soaked in acid mixed with water to dissolve calcium buildup. Self-cleaning models reverse their polarity regularly to deter calcium buildup. 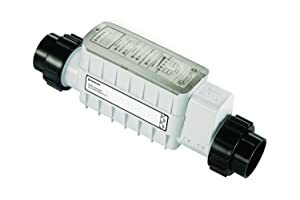 Another common type of chlorinators is the models with power backup timers; they store all their setting on these timers, just in case there is a power blackout. This feature enables these units to know when the water is flowing normally and when there is a problem. They switch off the pump and the chlorinator when there is a problem. Salt water chlorinator companies are developing models with built-in pH control. 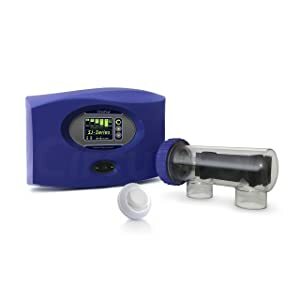 These systems are able to know the level of pH in a pool, and automatically take it to the right level by adding acid. Low pool maintenance – Installing these systems mean that you will spend less time maintaining your swimming pool since they kill bacteria and algae. Low chlorine levels – They generate chlorine when needed, meaning that you will not add excess chlorine to your pool. Low salt level – The amount of salt they release in your pool is similar to that found in human tears, meaning that there is no irritation of the eye when swimming. Kind to the hair and skin – The chlorine level will be low, meaning that you don’t need to deal with harsh chemicals of normal chlorine that dries your hair and damages the skin. It is critical you choose your system carefully to ensure that you enjoy a fantastic time in a safe, hygienic, and crystal clear pool 365 days. Therefore, before you settle on a specific brand or model, go through these tips for how to choose the ideal salt water chlorinator. When selecting the best unit, you should go for a chlorinator that is reliable. It should be built to work efficiently, be fuss-free, and last for years – especially in salty conditions. Your unit needs to be strong enough so as to get through these tough conditions. It will be an advantage if you choose a chlorinator that is provided by a reputable and well-known brand. A reputable company provides a high-quality product that will offer value for the money and last longer. Such a brand designs a product that will withstand harsh conditions and hot weather. We all want to take a dive, but only a few of us want to clean the pool. With the best chlorinator, you don’t need to frit. Maintaining your pool sparkling clean, free of algae and bacteria, and fresh is a breeze. You should make sure that your salt water chlorinator features a cutting-edge design and is approved to the right standards. Don’t just pick the trending model that hasn’t withstood the test of time. 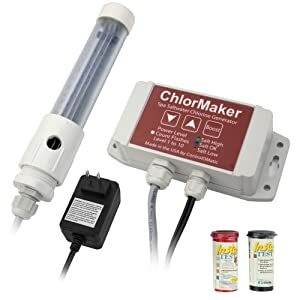 Surely, you cannot buy a salt water chlorinator without knowing if it will fit your swimming pool. Know the type of pool you own and its size. The last major factor that you should consider when buying your chlorinator is the amount of money you want to spend. Buy a unit that you can afford and has all the necessary features that your pool requires. Here is a review of the top 9 salt water chlorinators on the market today. The Goldline T-Cell-15 chlorinates up to 40,000 gallons of water and is perfect for inground swimming pools. The best thing, you can choose the right-sized unit for your pool from the T-Cell series of T-Cell-15 (40,000 gallons), T-Cell-9 (25,000 gallons), and T-Cell-3 (15,000 gallons). The product gives you the most efficient and cost-effective pool chlorination possible. The other notable feature of this product is the 15 feet cable that ensures it reaches all the corners of your pool. Its cells are based on the best Turbo Cell tech that made Goldline one of the most trusted models in salt chlorination industry. These cells automatically produce a self-renewing supply of pure and fresh chlorine for water that is clear, luxuriously soft, and clean. Dimensions: 18.2 x 14.5 x 8.2 inches. For inground pools: 40,000 gallons. Perfect for a 40,000 gallons pool. Comes with a long cable. With Goldline AQR15, you get to enjoy more chlorination that is worth every single penny you spend on this product. This bestseller salt chlorination system has reported over 1 million worldwide installations and continues to gain popularity due to its effectiveness. The system was designed to provide consistent results every time it’s operating. With this model, you don’t need to sanitize your swimming pool since it amazing functionality provides water that doesn’t cause skin or eye irritation. You will feel relaxed swimming in your pool. The product also eliminates the harsh chlorine smell as well as taste, leaving you with a freshwater pool. 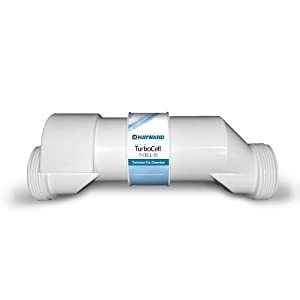 Another great feature of this chlorinator is its ability to convert the dissolved slats into chlorine in order to reduce your maintenance time. This also eliminates the chores of measuring and mixing of factory tablets or liquid chlorine to add to your swimming pool. Eliminates harsh chlorine taste and smell. Requires power center that is sold separately. The Goldline AQ-TROL-RJ is one of the best chlorinators that you can get for your swimming pool. It makes your pool better when you install it since it was designed to improve your swimming pool water quality. This comes into effect immediately you install the system in your pool. The model is also awesome when installing it since it takes just a few minutes. Programming it is also easy; this is what makes many people love this model. The manufacturer states that you can install and set it within 30 minutes. When the model is in place, you end up enjoying a silky and soft pool that you will love spending your time in. You don’t need to worry about having dry skin or red eyes. You will also get crystal clear water that is inviting to swimmers. The model also features a microprocessor that automates all its functions. Dimensions: 19 x 15 x 9 inches. For above ground pools: 18,000 gallons. Only for above ground swimming pools. The 521105 Intellichlor IC60 takes electrolytic chlorination to the next level when it comes to safety, reliability, and convenience. Electrolytic chlorine generation is the most convenient, most effective, and easiest way to keep your swimming pool sparkling clean. 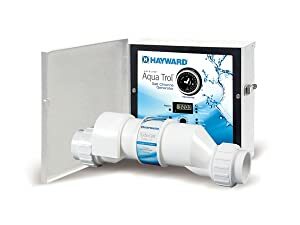 This system uses ordinary tabs salt to generate all the chlorine your swimming pool requires, right in your facility – automatically, effectively, and safely. It provides similar sanitation outcomes as a manual chlorinator, but without the drawbacks of manual systems. With this unit, you don’t need to purchase, carry, and store bulky and expensive chlorine elements. Furthermore, the product eliminates chlorine odor and doesn’t irritate your skin or eye or bleach your swimsuit. Dimensions: 1.5 x 0.6 x 0.6 inches. Doesn’t irritate your eye or skin. Enjoy silky smooth and clean pool the easy way with SwimPure Plus Salt System. The product uses non-iodized salt to electronically provide pure chlorine, removing microorganisms such as algae and bacteria from your swimming pool. What’s left is a clear, soft, and clean pool without any harsh chemical odor and a pool that doesn’t bleach your swimsuit or irritate your eyes and skin. All you should do is add a large dose of salt to this system in order to establish a solid base, and then you be adding small amounts periodically to keep the unit working properly. 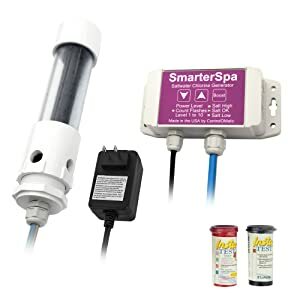 The system easily connects to your pool’s plumb line, reducing the cost of maintenance as well as time. It also features an easy to use control panel that comes with a digital salt level display. Dimensions: 13.5 x 8 x 5.6 inches. Produces chlorine from table salt. 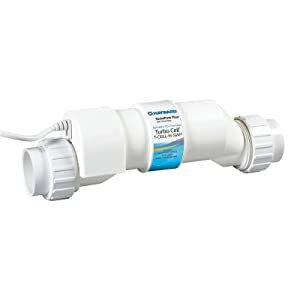 Connects to the pool’s plumbs line. Circupool SJ-40 delivers the ultimate in reliability and simplicity for your pool chlorination. The unit automatically keeps your pool water crystal clean, to provide a comfortable pool that is kind to your hair, skin, and eyes while completely eliminating the need of using algaecides, shock, and chlorine. No other system is as user-friendly, easy to operate, and durable than this product. The unit is guaranteed to operate and out-last other products that cost more and is very easy to install. Its installation process is a breeze; you don’t need to hire a professional to do this. The other notable feature of this product is that it works on both 110V and 220V. Like other SJ-Series, this product features a self-cleaning ability which is provided by reverse polarity. Dimensions: 20.5 x 20.5 x 10.5 inches. Easy to inspect the cells. Cases of calcium build up. ControlOMatic SmarterSpa was designed to improve your water quality by providing cleaner and clearer pool water. It uses natural salts to produce chlorine that doesn’t irritate your eyes or skin while removing other bacteria. The best part, this unit reduces your need for maintaining your pool since it takes care of your facility once you set it. You don’t need to add chlorine daily, just keep an eye on your pool’s pH since it might raise it. The product can also be used for spa and hot tubs. It also helps to remove the harmful chlorine smell from your pool and lowers the carbon footprint emitted, hence friendly to the environment. Dimensions: 12 x 6 x 4 inches. Perfect for spa and hot tube. It is very simple to program ControlOMatic ChlorMaker and even when using. It is a model that comes from a series of saltwater systems that are committed to providing the best results to the users. With this model, you will surely feel comfortable and is specifically designed for home spas and pools. With the unit installed, which is very easy, you will enjoy cleaner water and you won’t need to maintain your pool regularly. You will have a great time. The product can work 24/7 if you want, thanks to its 10 built-in power levels. Another notable feature of this unit is the self-cleaning ability that reduces the need for cleaning it. Dimensions: 4 x 11 x 6 inches. The Intex Krystal Clear comes in handy when you want to have an easy time chlorinating your swimming pool. Coming from a reputable company, you are guaranteed of getting a product that works effectively, better than other products in its class. It helps with your pool sanitation, leaving you with a clearer and cleaner pool. The product offers 2 stages of tech which are critical for sanitizing your pool. The first stage involves the provision of natural salt to your pool and then, the second, passing it via filters to create fresh and soft water. Your pool is now free from harsh chemical and odors. The product also removes contaminants from your pool. Dimensions: 12 x 13.8 x 17. 8 inches. For above ground pools: 15,000 gallons. All the salt water chlorinators we have reviewed above will offer value for money. 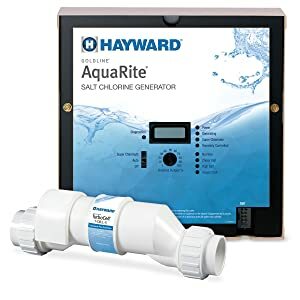 With that in mind, the Hayward Goldline T-Cell-15 TurboCell Salt Chlorination Cell stands out from the rest because of its amazing features which include affordable, efficient, comes with 15 feet cable, perfect for a 40,000 gallons pool, self-cleaning ability, and provides fresh and soft water for swimming in. This product works to ensure that your pool is clean and well sanitized. It produces chlorine from ordinary salt in an effective, safe, and automatic way. This means that you get chlorine from an affordable table salt, and you don’t need to deal with dangerous chemicals. For you to understand the process that takes place, you first need to know the basic components of a salt water chlorinator. Control box – It notifies the cells when it is the ideal time to activate and how long it should remain activated. In addition, it controls the performance of the cell and the flow sensor. Power supply – It is a transformer that provides DC current to the cells. Its purpose is to step down the current to 27 VDC. Salt cells – Salt cells are a series of coated titanium which are packed together with small spaces between them that enables water to flow through them. When the salt passes via the cells, the cells transfer DC current from plate to plate, converting salt to chlorine. Flow sensor – They make sure that the water is flowing well through the cells. The sensor cuts the power off if the level of water low. After knowing the components of a salt chlorinator, you can now understand the process that takes place. This process can be explained using an equation. Hypochlorous acid is the chlorine in your pool. Sodium hydroxide is the byproduct of chlorine generation. It has a high pH that raised alkalinity. Here are a few tips that will ensure that you keep your chlorinator in top condition. This will ensure that your unit lasts longer. Maintain the recommended level of salt of between 2700 to 3900 ppm (parts per million). During a downpour, turn off the system to minimize the risk of short-circuiting, this might destroy the chlorinator. Clean your product’s cells once or twice a year or follow the manufacturer’s recommendation. If possible, go for self-cleaning units since they prevent the possibility of calcium buildup. Ensure that the calcium level is kept to the minimum to avoid buildup while maintaining the ideal level for your pool. One major disadvantage of salt water chlorinator is that it uses salt water. Salt water can cause a lot of wear and tear since salt is corrosive. This might damage your swimming pool accessories, underwater light systems, and other pool parts. Of course, this will take decades before you notice it since the salt is in low levels. This water can also kill plants around your swimming pool. Q: What is a salt water chlorinator? A: It is a product that converts table salt to chlorine. Q: Are salt water swimming pool free of chlorine? A: They aren’t free of chlorine. A salt water chlorinator turns salt to chlorine. However, the amount of the chlorine generated is less and gentle on your skin and eyes. Q: What control algae, the salt or chlorine? A: The salt doesn’t prevent algae from growing or kill them. It doesn’t sanitize your swimming pool. This is the work of the chlorine that is produced by the salt. Q: How much salt will my pool require? A: This will depend on the type of chlorinator you have and your pool size. Always follow the manufacturer instructions when adding salt to your chlorinator. Q: Should I buy a special type of salt? A: No. You only need to have non-iodized salt. This is the table salt. Q: Will the salt destroy my pool’s vinyl lining? A: No, it won’t. Damage to this lining might be caused by UV rays. Q: Do I still need to stabilizer my pool if I have a salt water chlorinator? A: The salt only adds chlorine; hence you will need to balance the other chemicals by adding them. Q: Will my electricity consumption go up? A: Yes. But it is cheaper than buying chlorine and then adding it to your swimming pool. There are different ways of maintaining your swimming pool. 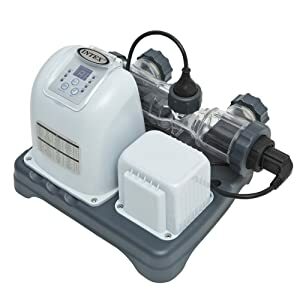 One best way is to get the best salt water chlorinator for your pool since it makes the water to feel good on your skin, become clear, cleaner, and provides other benefits. If you have dreamed of buying a chlorinator, but it seemed so hard, you now have a guide on how to go about it.